Picture this: College student and underachieving second born Darby Thorne white-knuckling her way through a raging blizzard in the Colorado Rocky Mountains to her mother's hospital bed in Utah. Howling winds buffeting her '94 Honda Civic, snow blanketing the icy road and piling up in waist high drifts along the shoulders. Steam sizzles off the hood. She hasn't seen another car in an hour. Quarter tank of gas. Cell phone dying, because she'd left the charger in her dorm room. But it doesn't matter anyway because there's no cell coverage at nine thousand feet above sea level. No radio reception, either. Left wiper flapping on the windshield. And then it swirls away into the darkness. The right wiper is failing, too. "One longhouse structure (visitor center restrooms, maybe a volunteer-run convenience store or coffee shop) nestled among wind-blasted firs and chapped rock faces. A bare flagpole . . . taxpayer funded art . . . parking lot with a handful of parked cars—other stranded motorists like herself, waiting for the snowplows to arrive." "First was the red truck. Sandbags in the bed, webbed tire chains. . . . The second car was completely buried, just an unrecognizable mound of snow. She couldn't even discern the color . . . Last was a grey van." As she cuts between the vehicles to reach the footpath to the front door, something in the van catches her eye. A tiny, doll-like hand gripping a latticework of metal bars. "She crept closer, cupping her hands against the window, squinting inside. Her eyelashes fluttering on cold glass . . . There's a child locked inside this van." Meaning there's a kidnapper inside the rest area, and Darby, the kind of girl who drinks Red Bull and names her car, is tasked with outwitting a deviously twisted psychopath. But which one is it? she wonders when she steps inside. Ed? ". . . late fifties, a yellow Carharrt jacket, one earring, and a silver goatee. Like a sad-eyed pirate." Ashley? "The guy was tall, broad-shouldered, about a year or two older than her. He could be one of the Alpha Sig guys her roommate partied with . . . a slick mop of hair, a green North Face jacket, and a shy smile." Lars? "Man was a stretch. He was tall but slouching, rail thin, nineteen at most. A weasel-like profile to his acne-encrusted face, all overbite above a shapeless chin shrouded with peach-fuzz whiskers. A Deadpool beanie and a baby-blue ski jacket." Sandi? ". . . Ed's wife, apparently—sitting beside him. She was a fussy little fortysomething with a black bowl cut and a crinkly yellow parka . . ."
Before the night is over Darby will find herself battling obstacle after obstacle in her unrelenting determination to save that child and her fellow travelers from the monster in their midst. The publisher challenges you to read the first chapter—pages 3 to 22—and not be hooked. But be prepared to call in sick or skip school tomorrow, because this book will keep you up reading all night. 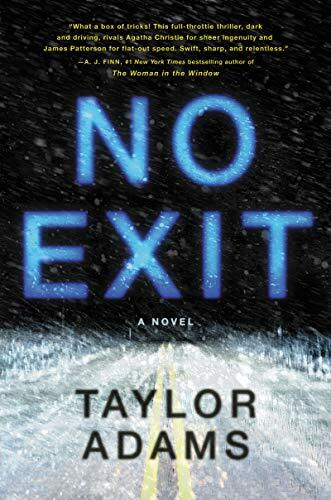 Author Taylor Adams brings left field surprises one after the other at a speed that will force you to stop reading every once in a while so you can catch the breath you're holding and remind yourself it's only fiction. Darby is a heroine who survives everything thrown at her. But there is a limit. When will hers be reached? "The door closed. She took a few shaky steps outside, her Converse sinking into fresh snow, her heart banging against her ribs. . . . Darby shivered and watched the door. No need for concealment now; she held the Swiss Army knife like an icepick as she stood in the orange light, waiting for the door to creak open. But it didn't . . . What had gone wrong?" ". . . Fireworks behind her eyes. Dizzying pain. The cartilage in her nose made a wet crunch and she recoiled backward, nearly falling off her chair, clasping both hands to her face." No Exit is A KNOCKOUT! Readers will press their hands to the sides of their face and wince in alarm! Roadtrippers will never again stop at a highway rest area without thinking of this wowza of a book. Here's hoping for a movie!